Srichakra Engineering Equipments was established in the year 1985. We are one of the leading manufacturers and suppliers of wide varieties of hydraulic presses that are used in gamut of industrial applications. Our spectrum of hydraulic presses caters to the industrial segments like plywood, block boards, flush doors, wood compreg, mica rubber, particle boards, coir, mattresses, high pressure laminates, PC boards for electrical insulation and pre-presses with built-in chain conveyors. We have highly sophisticated and state of art manufacturing facility at Bangalore, India, through we which we handle manufacturing and global delivery. Defect free products, quickest delivery time and service are the three major core values of our firm. We are an ISO 9001:2008 certified company. Over the years we have successfully installed more than 2000 different types of hydraulic presses across India and world. 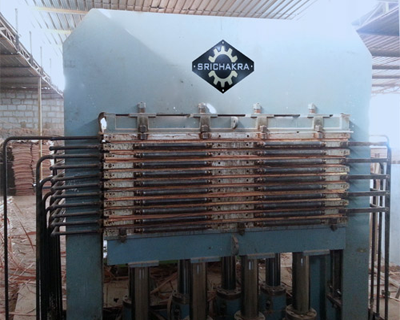 A professionally managed organization, Srichakra Engineering Equipments is a reputed hydraulic press manufacturers in India. We have established a state-of-the-art infrastructure facility, which help us in manufacturing bulk requirements of these products, in adherence with the international quality standards and norms. Under the able leadership and management, we have carved a niche for ourselves and have become one of the leading manufacturers, suppliers and exporters in the industry. Our firm constantly moves forward to the limits ahead of the imagination to guarantee customer delight every time. Our progress is mainly attributed to an aggressive attitude towards engineering excellence, innovation, quality, service and customers experience with our products. We are one among the very few exporters of hydraulic presses from India. Hydraulic presses are essential in number of industries, construction firms, metal fabrication industries, wood processing depots etc. Typically, hydraulic presses are known as backbone of mechanical industries. Depending on the end use, there are many different types of presses such as hydraulic laminating press, particle board press, hydraulic plywood press, coir mattress press, block board press, doors press etc. The hydraulic laminating presses are used in fabrication or laminating wooden components, plywood, partition boards, MDF boards etc. 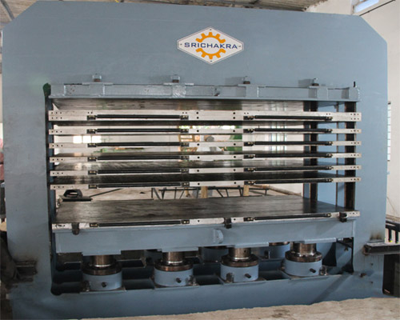 Srichakra's hydraulic laminate press is the machine that is in great demand in wood processing units. 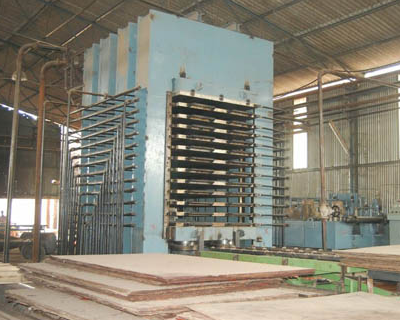 Plywood presses are found useful in plywood making companies and timber depots. Hydraulic press has emerged as a major alternative for mechanical and pneumatic press due to the various features/advantages its offers. Hydraulic operated machining presses are considered more efficient, economical, lower maintenance, faster operation and durable. Our hydraulic machining presses are designed to offer maximum performance with limited maintenance. We offer hydraulic presses with different daylights and capacities. Being one of the India's largest manufacturers of hydraulic presses, we have always put quality of our machines on forefront. Delivering flawless and fine products is our ultimate goal and we strive hard for that. 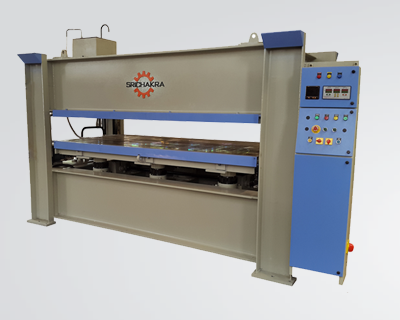 Srichakra Engineering Equipments is one of the most promising manufacturers and suppliers of qualitative range of hydraulic press, door press, hydraulic laminating press, bonding press. Our products are extensively used in machining, plywood and coir industries across the world. By using hydraulic press we can achieve excellent accuracies in drawing, forming and other machining operations. Srichakra Engineering Equipment's after being founded in 1985 has grown into one of the most trusted name for wood presses. Through our highly committed work force, we are able to delivery the highest quality products for the past 28 years.